iFrames are commonly used on embedding 3rd party services to your web page. Social sharing buttons, various widgets, and most of the stuff out there is added with an iFrame code. Don't know the difference between embed codes? Check it out here. 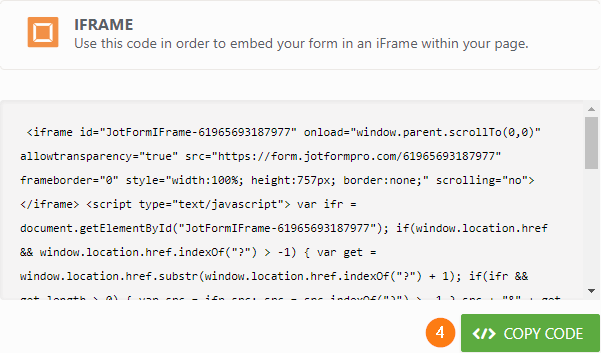 Copy the iFrame Embed Codes correctly and pretty much nothing can break the form on your page. Since your form is called inside an iFrame it does not conflict with anything on your page. 1. Click PUBLISH at the top of your Form Builder. 2. Go to the EMBED section. 3. Select the IFRAME embed option. 4. Lastly, click the COPY CODE button to copy the codes. Tell us how'd you do? Please share your thoughts and suggestions in the comments section below. Trying to embed JotForm contact form. Using IFRAME doesn't work - preview shows a long, skinny rectangular box. Using Souce Code - preview cuts off the bottom (as others have mentioned) and freezes up the screen. Please advise on if this will be fixed or how else I can put a contact form on a custom page! I did ... still same oroblemproblem. Where do I put the copied code? We just changed the template of our Wordpress site and our jotforms no longer appear. I've used every embed code that you provide and none work. We do not have a paid subscription to add a plugin. Any suggestions? This is still not working and it is very frustrating that you guys do not have a human I can speak to on the phone. Hi my email is juicycambabes@outlook.com I can not seem to get the pay pal subscription payment working. Could you please help me ? The frame code does not work. Also the buttons that I put on the form doesn't work either. The Print button and the clear form button doesn't work. The only button that does work is the submit button. I got your test. and not its not embeded. its just a link and I have had 3 ppl say they did it, but I never got anything! My issue is with the poll redirect to at external page, I want the finding to appear in our already embedded site. I tried the iFrame code but it did not solve the problem of the 'Thank You' message box being a the top of the screen under the header instead of visible after the Submit button is clicked. Still cannot reduce the height - is there a different icode to insert somewhere? I am completely puzzled. That has solved the problem. That took care of it, thanks! THIS IS AWESOME and it was so easy to do to help parents register children for camp from their smartphones (the straight "embed" code we were using only allowed the form to work on computers most of the time). I have done the above and copied the Iframe. here below the result. Preview current internet page the form is visible. Preview of the entire website is the form not showing up!!!? I have tried this with 3 internet explorer, (internet explorer 11-Firefox-Opera). Results are the same. My website is in own environment in development and not yet visible on the internet. I hope someone can help me as soon as possible with a working solution. This puts up a midget sized contact form. Not adjustable either. I used the actual code for Wordpress because I have a wordpress website and when i tested the form it is just not sending to my email to alert me that someone filled out the form. This is especially useful when integrating a Square payment option. The iFrame allows Square to work without the whole website having to be SSL certified (with HttpS pages)! What is this iframe code you sent me? should I be using this code with my own iframe code? Thank you unfortunately it will not let me delete the current code or insert the new code: How do I do that. what I mean. The forms are on the site but are not steady! I always copy the iframe code. I had made no changes. The forms stopped loading, then they loaded slow, then they seem to be working atleast for now. I have made no changes. Once I have done all of these steps, do I need to do anything else? or is it automatic? I used the iFrame code and tested the form from a friend's computer. The form went through (I received the "thank you for your submission" message), but I didn't received an email with the form. What now?! it worked flawlessly, very clear instructions. Thank you! This message is to Welden. What is wrong with my page embed code ??? When I use the code off my webpage, the page loads no problem ? Also, until recently...this page worked just fine ! So, I dont understand how the code has suddenly become "Wrong" ??? The exact code works on another page on my website ! The only difference between the 2 is that the other page is in Chinese ! Also, the above "Embed Code" button on this page is absolutely useless ! I've solved this by embedding the source code, seems to work OK. Anybody know any reasons not to do it this way? I found out that if you have Adblock Plus or any adblocker enabled, none of the iframe or embedded methods will work. I hope this helps anyone experiencing blank page issues. iFrame works great in Safari & Chrome but it comes up blank in Firefox. Using Concrete 5 for website building. Simple question I hope! Once form is embedded (that bit worked, thank you! ), if you make changes to the form within Jotform does the embedded form update? Can you please clear the form cache for this form?